Health experts have touted the virtues of eating quinoa for years. Basically, it's a miracle grain. "It is gluten-free, high in fiber, packed with antioxidants and full of nutrients like iron, zinc and magnesium," explains Jessica Rosen, president of Raw Generation and certified holistic health coach. "Quinoa is a complete protein, offering nine essential amino acids while still remaining low in calories. Eating quinoa promotes weight loss and improved health." But did you know that quinoa has major skin and hair benefits, too? Yep, it's true — and it's why we're seeing this superstar ingredient pop up in everything from moisturizers to shampoos. A 2015 study published in the International Journal of Cosmetic Science found that quinoa is rich in proteins, polyphenols and amino acids that could help prevent skin aging. "The chewy part of quinoa is riboflavin, which makes skin more elastic and flexible," says Susie Wang, expert cosmetic chemist and founder of 100% Pure. "Quinoa is also rich in vitamin A, which eventually converts to retinol in our skin and accelerates cellular turnover." Wang says that quinoa also contains quercetin, which is anti-inflammatory, as well as vitamin E, iron, magnesium, calcium, potassium, phosphorus, zinc copper, manganese and selium — all of which are important for strong, healthy skin. As for your hair, "quinoa proteins add strength and protection to your hair," says from Boyce Clark, a Ph.D., member of the Society of Cosmetic Chemists and CEO and Founder of Lubricity Labs. "Quinoa has the highest concentration of protein of any other grain and it has some of the essential amino acids that your body can't make on its own." Clark explains that when quinoa proteins are chemically cut into smaller pieces via enzymes — aka when they're hydrolyzed — they match the keratin naturally found in your hair. When your hair is damaged by heat, chemicals or the sun, these hydrolyzed pieces fill in the gaps, repairing your mane. 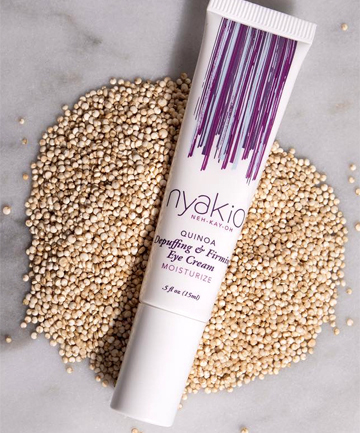 Want to add quinoa to your beauty routine? We've rounded up the top skin and hair products with this superfood ingredient.